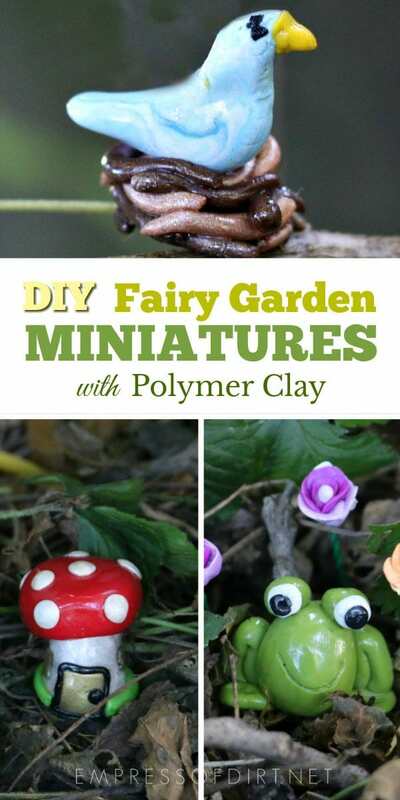 Make your own miniature fairy garden accessories and charms with polymer clay. 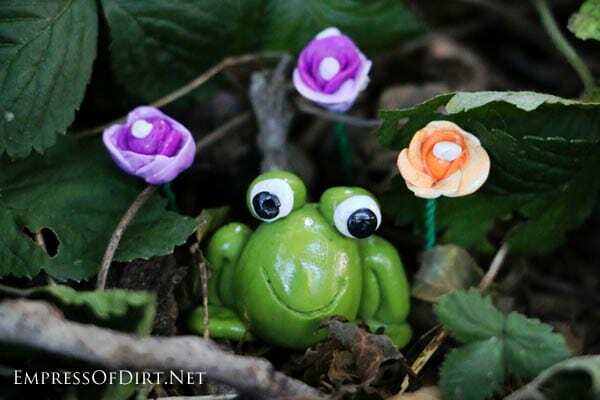 I’ll show you how to make a fabulous frog, flowers, and a simple acorn birdhouse. If you’re new to using polymer clay, see Polymer Clay Charms 101 for everything you need to know to get started. 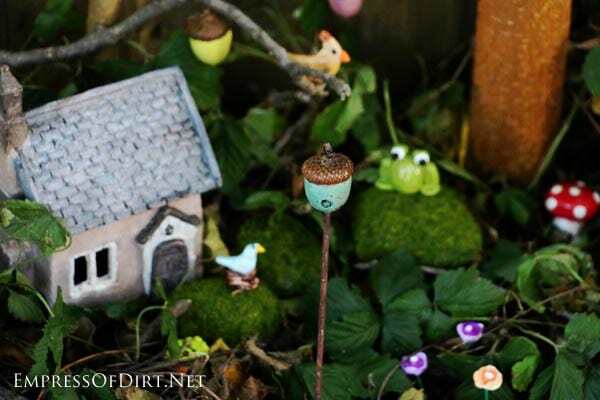 A really helpful idea is to start with a theme for your fairy garden (this post has tons of ideas to get you started). Once you pick a theme, make a list of all the things you need. It could be pirates, gnomes, cupcakes, butterflies, cars, or anything else your heart desires. Once you’ve got a theme and your list of accessories, figure out which items can be made from polymer clay. Make sure you get the type that is baked not air-dried. 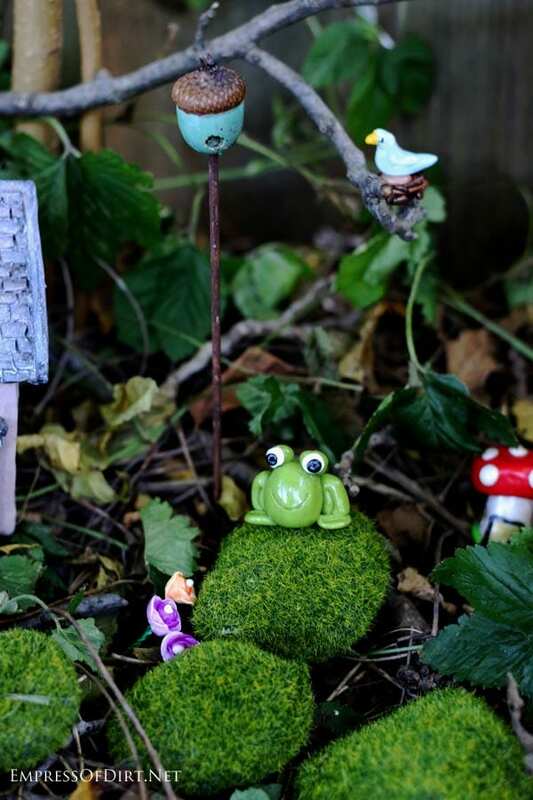 Rather than providing endless tutorials on how to make every single fairy garden miniature you see here, I thought I would show you a few examples and show you how I approach it. Once you adopt the ‘start at the end’ or ‘reverse engineering’ process, you really can make just about anything you want. This first one is not actually made of polymer clay. 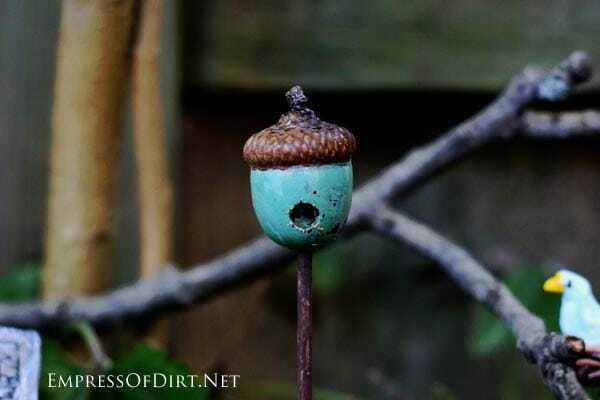 It’s just an acorn and a bamboo skewer. 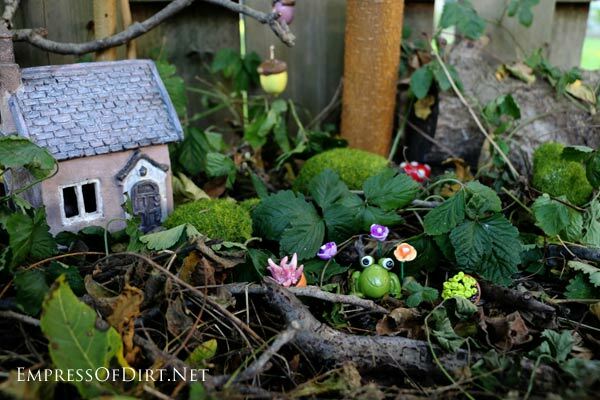 And, in addition to clay, I’d encourage you to make use of all sorts of natural materials (twigs, grasses, moss, leaves, stones…) to make your fairy garden awesome. Acorns have two parts: the nut and the cap. To make any miniatures, I find an example on Pinterest of one I want to make (or one that is close enough), and then jot down what needs to happen. From there, I figure out the most logical order. 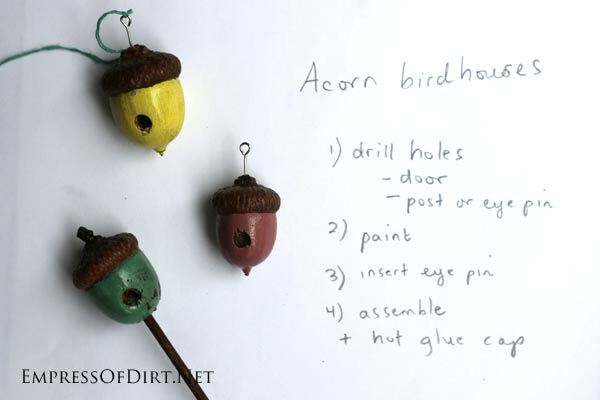 Drill holes for door, post (to stand it up) or eye pin (to hang it up). It’s good to drill before painting and assembling in case it messes stuff up. You can prevent mishaps by drilling a small pilot hole first and then drilling the larger door hole. Insert the post (bamboo skewer) or eye pin. These eye pins are used for making necklaces. Here I inserted it through the acorn cap (I just had to press firmly). Next I bent the end of the eye pin under the cap. Hot glue holds the cap on the nut. I use a mini hot glue gun. Hang up with invisible thread (used for quilting), thread, or fishing line. 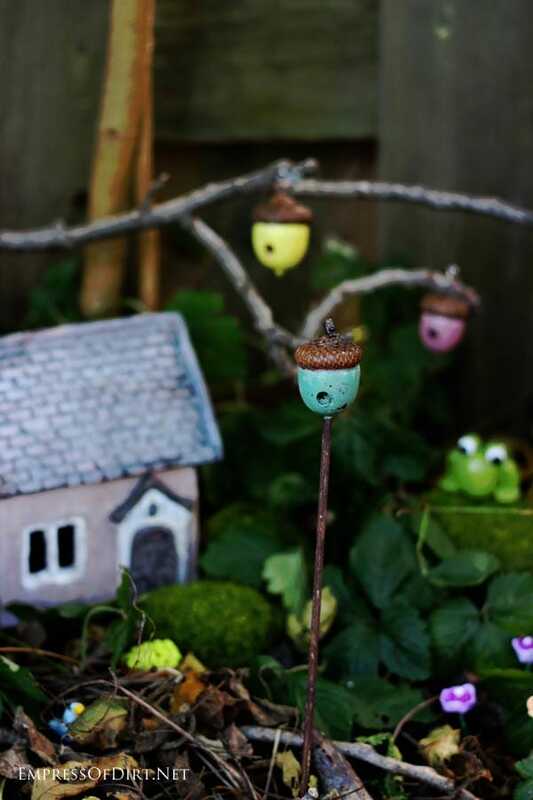 Or insert a bamboo skewer, paint it brown (I use acrylic craft paints for everything), and stand it up in the fairy garden. There’s two basic choices with fairy garden accessories. You can make them realistic or more cartoon-y or fantasy-like. I think cartoony is easiest for beginners. 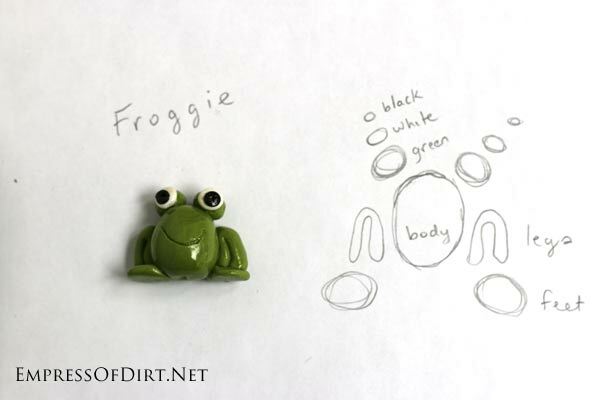 This style of frog has been around for decades, probably because it’s cute and super simple to make. 3 colours of polymer clay: green, white, and black. Body/head: one big oval ball of green clay. Eyes: 2 white balls of clay (flattened) and 2 smaller black ones. Legs: roll out 2 sausages of green clay, bend in half, press onto sides of body. Feet: 2 flattened balls of green clay. Bake according to directions on clay package. When baked and cool, I add a coat of polyurethane for a protective, glossy sheen. These flowers look good placed around the fairy garden, giving it a Wizard of Oz fantasy style. The trick to making flowers is to use a few different values of the same colour. Here I took the base colours (peach and purple) and added white clay to lighten them, making 3 values of the same colour. The flower petals are made by taking tiny balls of clay and pressing them flat and thin. Start in the middle and add one petal at a time, using slightly lighter colours as you work your way out. Each new petal overlaps the previous one by half. 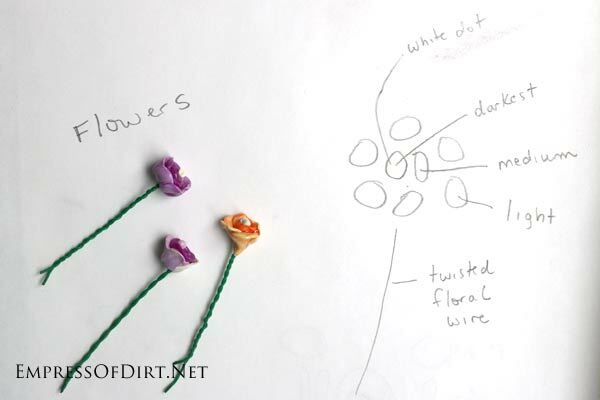 Floral wire is twisted and inserted in the flower before baking. You can make a lot of accessories in just one afternoon. And, as you can see, they add a lot of charm to the garden. 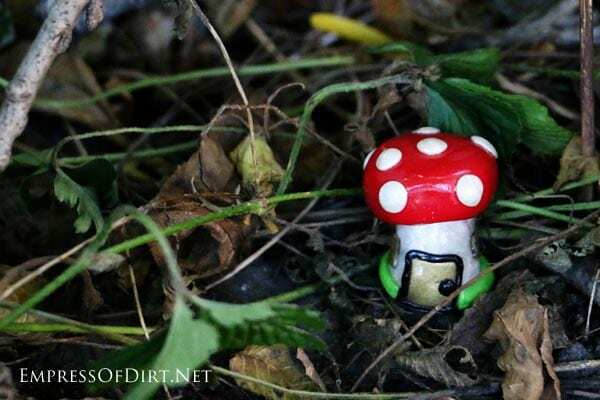 I’m old school when it comes to fairy gardens, so a classic toadstool is a must. 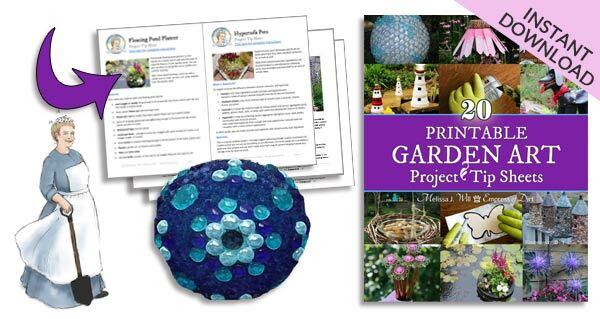 Want living plants in your little garden? Here’s a guide to the best plants to choose for miniature gardens. I hope this has given you a starting place and the confidence to try making some charms. The good news is, you can use and reuse the clay until you make something you like. Just bake it when you’re ready to commit. And be sure to check the Polymer Charms 101 Starter Guide for more tips and tools. And make a fairy garden fountain that really works! I read this is the spot to click for a giveaway from Janit. I love the idea of a minature garden and hope to pursue one in the near future. I’m sure her book will give me some good ideas such as she has demonstrated in the newsletter.